Pizza and other Italian specialties are prepared in authentic style with farm-fresh products. : Thin chewy pizzas, made with naturally leavened dough, emerge in rapid succession from the wood-fired oven. Toppings can include anything from Dungeness crab to arugula, and freshly-made mozzarella keeps them creamy and luscious. 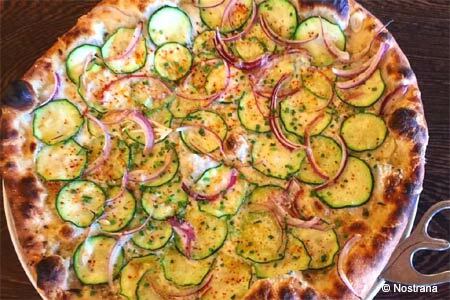 In a nod to Italian custom, diners cut their own pizza. Chef Cathy Whims has cultivated collaborative relationships with local farmers, even working with them to grow Italian specialty crops such as borlotti beans, greens and wild fennel. Pair a pizza with the eponymous salad, a bowl of radicchio tossed in a Caesar-style dressing, for a satisfying meal. The menu changes frequently, but always offers temptations such as goat cheese-stuffed pappardelle with sugar snap peas and mint, and Idaho trout with porchetta. For dessert, sample a selection of cheeses with Amaro (a traditional herbal liqueur) or the butterscotch budino. The mostly Italian wine list offers interesting if sometimes costly selections. We also recommend labels from local Cameron Winery. Service is pleasant and family-friendly, with long tables available to accommodate large groups.